To understand the great confusion about global warming or climate change, my most lucid guide has been Dr. Richard Lindzen — a former Alfred P. Sloan professor of meteorology at MIT and member of the US National Academy of Sciences — and his now famous lecture for the Global Warming Policy Foundation last October 8. In just a number of segments of his lecture, Dr. Lindzen crystallized for me why the church of global warming errs so badly in its dogma. Global warming promoters fostered the popular public perception of the science of climate change as quite simple. It is that here’s one phenomenon to be explained (“global average temperature,” or GAT, which, says Lindzen, is a thoroughly unscientific concept). And there’s one explanation for it: the amount of CO2 in the atmosphere. GAT is only one of many important phenomena to measure in the climate system, and CO2 is only one of many factors that influence both GAT and all the other phenomena. Most people readily confuse weather (short-term, local-scale temperature, humidity, precipitation, wind, cloudiness, and more) with climate (long-term, large-scale of each) and think weather phenomena are driven by climate phenomena; they aren’t. Consequently, as Lindzen says, the currently popular narrative concerning this system is this: The climate, a complex multifactor system, can be summarized in just one variable, the globally averaged temperature change, and is primarily controlled by the 1 to 2 percent perturbation in the energy budget due to a single variable — carbon dioxide — among many variables of comparable importance. Would it surprise you to learn the greatest global two-year cooling event of the last century just occurred? From February 2016 to February 2018 (the latest month available) global average temperatures dropped 0.56°C. You have to go back to 1982-84 for the next biggest two-year drop, 0.47°C—also during the global warming era. All the data in this essay come from GISTEMP Team, 2018: GISS Surface Temperature Analysis (GISTEMP). NASA Goddard Institute for Space Studies (dataset accessed 2018-04-11 at https://data.giss.nasa.gov/gistemp/). This is the standard source used in most journalistic reporting of global average temperatures. The 2016-18 Big Chill was composed of two Little Chills, the biggest five month drop ever (February to June 2016) and the fourth biggest (February to June 2017). A similar event from February to June 2018 would bring global average temperatures below the 1980s average. February 2018 was colder than February 1998. If someone is tempted to argue that the reason for recent record cooling periods is that global temperatures are getting more volatile, it's not true. The volatility of monthly global average temperatures since 2000 is only two-thirds what it was from 1880 to 1999. None of this argues against global warming. The 1950s was the last decade cooler than the previous decade, the next five decades were all warmer on average than the decade before. Two year cooling cycles, even if they set records, are statistical noise compared to the long-term trend. My point is that statistical cooling outliers garner no media attention. The global average temperature numbers come out monthly. If they show a new hottest year on record, that's a big story. If they show a big increase over the previous month, or the same month in the previous year, that's a story. If they represent a sequence of warming months or years, that's a story. When they show cooling of any sort—and there have been more cooling months than warming months since anthropogenic warming began—there's no story. Of course you did not know that unless you follow NASA, Real Clear Markets, or Watts Up With That. Meanwhile, everyone is constantly bombarded with total garbage like Al Gore's claim Migrant Caravans are Victims of Global Warming. 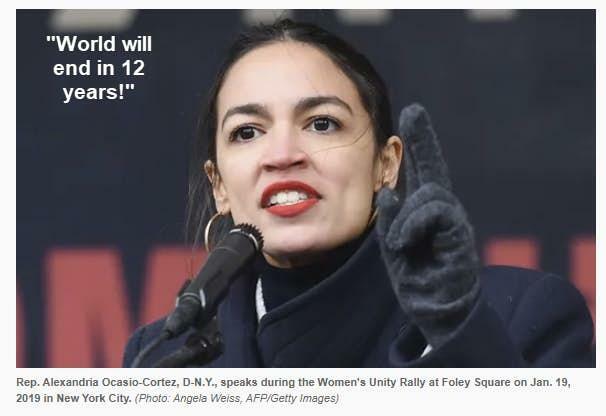 And of course, the media is fawning all over AOC's "New Green Deal" hype as she too is a believer the World Will End in 12 Years if we don't address climate change. The Guardian and the Intercept are both happy to promote this nonsense as of course the entirety of mainstream media. When I was in grade school we had major alarm bells over global cooling. In high school it was population growth. Then came food shortages followed by peak oil. Now the crisis du jour is global warming. Watts Up With That accurately labels global warming hysteria as the CO2 Derangement Syndrome. That's an excellent synopsis of the current state of affairs so please give it a good look. Finally, even if you still believe global warming is a threat, please ponder the notion that governments will not do anything sensible about it.